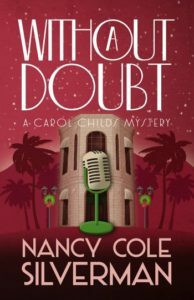 The following is a guest post by Nancy Cole Silverman, author of Without a Doubt, a Carol Childs Mystery. At some point in life, most of us will need to reinvent ourselves. The job market, like some of us grew up with, no longer offers a gold watch after twenty-five years of service. And once out the door, it’s more a matter of reaching for that brass ring and hoping for the best. Growing up as a sixties chick, I never gave it much thought. The year 2000 seemed impossibly far off. Like most young people anyone into their sixties seemed ancient. I never thought I would live long enough to see the new millennium. That in itself seemed like an impossibility. Although I wasn’t alone. Remember Y-2K? Fears that planes would fall out the sky and our computers would stop working? Fortunately, the doomsayers were wrong and none of it happened. But, once 2001 rolled around, things changed. While planes weren’t falling from the sky, the job market – for those of us pushing fifty plus anyway – was in a definite downward spiral spin. Nobody dared called it ageism, but we all knew what it was. It was then it dawned on me that I was going to have to have to reinvent myself. At the time, I was working in radio, an industry I had grown up in. But like everything else, radio was also going through its own changes. The FCC had lifted its ownership requirements on television and radio stations, and larger stations were swallowing up smaller stations like Pacman. Announcements of mergers and purges of longtime employees were becoming an almost daily event. That truth was never more evident than the day I walked into my office and learned the radio station I worked for was going to be sold, and, I too, was about to be purged from the industry that birthed me. Now we’ve all heard the phrase, “You can take the kid out the blah-blah, but you can’t take the blah-blah out of the kid.” For me that was radio. I simply couldn’t leave it behind. I had grown up with it. My father and I had made my first crystal diode radio set when I was just seven-years-old. I remember stringing the antenna through the grapefruit orchard behind my house and spending my nights tucked in bed, listening through headphones to late night mystery theater. I loved it. To me, there was no greater form of storytelling. I suppose it’s no surprise, that after nearly twenty-five years in broadcasting, I decided to swing for the brass ring. After leaving radio, I reinvented myself, leaving my news and copywriting days to work as a novelist, writing about what I know best. Radio. I’ve placed The Carol Childs Mysteries inside a radio station because that is where I’m most comfortable. I liked the idea of creating a female protagonist, a middle-aged woman who has chosen to reinvent herself as a reporter. Her boss, a whiz-kid half her age, calls her the Worlds’ Oldest Cub Reporter. It’s a world I get. Where what happens behind the mic is every bit as exciting as the news stories Carol covers. It was like returning home. More about the author and her work: Nancy Cole Silverman’s website. Nancy Cole Silverman credits her twenty-five years in radio for helping her to develop an ear for storytelling. In 2001, Silverman retired from news and copywriting to write fiction full time. In 2014, Silverman signed with Henery Press for her new mystery series, The Carol Childs’ Mysteries. The first of the series, Shadow of Doubt, debuted in December 2014 and the second, Beyond a Doubt, debuted July 2015. Coming soon, in 2016, is the third in the series, Without A Doubt. 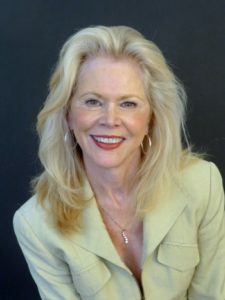 Silverman also has written a number of short stories, many of them influenced by her experiences growing up in the Arizona desert.